France has long been known to be one of the oldest and most important wine producing countries by almost everyone and, most notably, the Pope himself. Many people do not know that the Pope’s home was not always in the Vatican, but that in the French town of Avignon that hosted several in the papal line in the 1300’s. The Pope, who is considered to be one of the more prominent people on Earth throughout history, was probably even more influential at this time. As such, the small wine growing region, known at that time simply as ‘Vin D’Avignon’, devoted a special blend to the Pope, naming it ‘Chateauneuf-du-Pape’, which translates to ‘New Castle of the Pope’, or in the Pope's case, simply his new home. 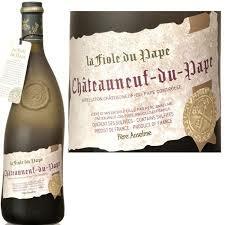 Today Chateauneuf-du-Pape is easily recognizable in liquor stores due to its interestingly warped bottle shape. A now debunked, but nevertheless interesting rumour, was that the bottle was designed to fit in the Pope’s own hand. The bottle shape is actually a more modern invention, and the design was meant to express the movement of the Grenache vine which is the main grape in the Chateauneuf blend. There are 18 grape varietals officially allowed in the region, many of which are white varietals. It is the red Chateauneuf-du-Pape, however, that has garnered the most international attention, and accounts for 97% of production. The main red varietals include Grenache, Syrah, Mourvedre and Cinsault. Chateauneuf-du-Pape wines tend to exhibit flavours of blackberries, currants, gamey spices, as well as herbs and flowers such as lavender and time, which by law are meant to be grown alongside the vines on every property. The soil is covered in naturally occurring stones called galets, and help to reflect and absorb heat, thus allowing the grapes to ripen more quickly. They also allow the soil to retain moisture, so the soil does not dry out in the hot sun of Southern France. If your mouth is watering just hearing about this wine, fear not, The Home Vintner has got you covered! While the official name ‘Chateauneuf-du-Pape’ is trademarked, we carry both an entry level Vintner’s Reserve kit (more of a medium bodied style) as well as a premium Selection line kit (a fuller bodied style) called Vieux Chateau du Roi from this same region. Kits typically take 4-6 weeks to make at sea level, due to the altitude and frequent barometric pressure fluctuations in Calgary, it can sometimes take longer. To get the most out of your finished product, we highly recommend you use specific gravity readings to gauge how far along your wine is. We also highly recommend at least 3 months of bottle age prior to drinking. This has historically been one of The Home Vintner’s most successful kits, and it has garnered many awards in both provincial and national competitions. As for food pairings, think gamey meats such as lamb, duck or wild boar if you are feeling particularly adventurous. Roasted Portobello mushroom is another great choice, or just sit down with a large chunk of Brie in front of the fireplace and enjoy!